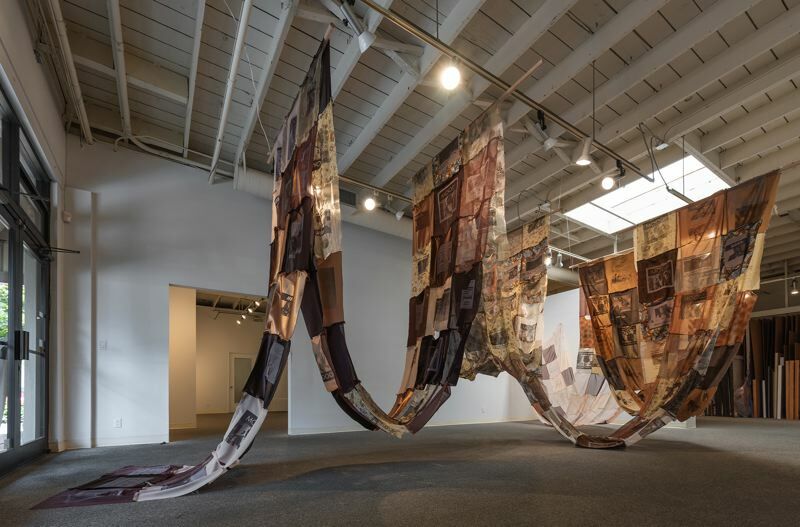 A large-scale installation that uses fabric and copper-etching techniques is taking over Clackamas Community College's Alexander Gallery from April 1 through 26. "On Our Watch" showcases Portland artist Melanie Stevens' recently composed digital prints. Stevens often juxtaposes images from mass media with her newly imagined compositions, said CCC instructor Kate Simmons. "I think the title, 'On Our Watch' speaks to inspiring a dialog that explores the idea of race discrimination that has occurred during a time when we all know it shouldn't," Simmons said. "If You're Watching This It's Too Late" is the name of a large-scale piece that will take up most of the gallery's exhibition space. "There will be three pieces total in the show, the large installation and two digital compositions that hang on the wall," Simmons said. "I think, 'If You're Watching This It's Too Late' speaks to the idea that many people have witnessed events of race discrimination that occur and have occurred and do nothing to fight against it. By the very act of viewing this work and images of these events that have already been filtered through the documentation process, 'we' the viewer are already 'too late.' The events have occurred in one way or another. But, by taking the time to inspect and contemplate the images and ideas Stevens puts forth, maybe it won't be 'too late' for us as individuals to do something next time when we are faced with an act of discrimination because we will have a greater sensitivity." Stevens is the co-founder and director of Miss Anthology, an organization seeking to support and publish racially and economically diverse young comic artists who identify as female or LGBTQIA+. She is the co-curator of the Nat Turner Project, a migratory gallery space for artists of color intended to create an environment of inclusivity, "a communal harbor for artists previously silenced by institutional constraints." An artist's reception will be held from noon-1:30 p.m. Wednesday, April 10, in the Niemeyer Center on the Oregon City campus, 19600 Molalla Ave. The artist will speak about her work at 1 p.m. Light refreshments will be served. This exhibition is free and open to the public. The Alexander Gallery is open from 9 a.m.-5 p.m. Monday-Friday, except for campus closures.